We’d love your help. Let us know what’s wrong with this preview of The Real Boy by Anne Ursu. On an island on the edge of an immense sea there is a city, a forest, and a boy. The city is called Asteri, a perfect city saved by the magic woven into its walls when a devastating plague swept through the world years before. The forest is called the Barrow, a vast wood of ancient trees that encircles the city and feeds the earth with magic. And the boy is called Oscar, a On an island on the edge of an immense sea there is a city, a forest, and a boy. The city is called Asteri, a perfect city saved by the magic woven into its walls when a devastating plague swept through the world years before. The forest is called the Barrow, a vast wood of ancient trees that encircles the city and feeds the earth with magic. And the boy is called Oscar, a shop boy for the most powerful magician in the Barrow, who spends his days in the dark cellar of his master’s shop grinding herbs and dreaming of the wizards who once lived on the island. Oscar’s world is small, but he likes it that way. The real world is vast, strange, and unpredictable. And Oscar does not quite fit in it. But it’s been a long time since anyone who could call himself a wizard walked the world, and now that world is changing. Children in the city are falling ill; something sinister lurks in the forest. Oscar has long been content to stay in his small room, comforted in the knowledge that the magic that flows from the trees will keep his island safe. Now, even magic may not be enough to save it. To ask other readers questions about The Real Boy, please sign up. Orinoco Womble (tidy bag and all) Read the blurb, up there under the title. There's no point in cutting-and-pasting it for you...it's already there. I had to put a lot of thought into this review. Anne Ursu has done that to me with her last two books. I enjoyed her Cronus Chronicles series and it was novel in that it presents a family with people of mixed racial heritage in a very normal, everyday fashion, and I loved that about the books. Plus, it was just plain fun Greek Mythology fantasy with a spunky heroine and her good natured cousin along for the ride. With Breadcrumbs, she gave us a young girl who touched me deeply. Her internal life I had to put a lot of thought into this review. Anne Ursu has done that to me with her last two books. I enjoyed her Cronus Chronicles series and it was novel in that it presents a family with people of mixed racial heritage in a very normal, everyday fashion, and I loved that about the books. Plus, it was just plain fun Greek Mythology fantasy with a spunky heroine and her good natured cousin along for the ride. With Breadcrumbs, she gave us a young girl who touched me deeply. Her internal life and her attachment to a friend as an effort to deal with loneliness and rejection was a visceral ache. I think with The Real Boy, she has strummed that emotional chord again. Oscar is an orphan who was 'bought' by a charmer to watch over his shop, do the cleaning, and to prepare his herbs for the potions he sells. It is never explicitly stated, but I believe that Oscar has autism. He has sense-related issues (will only eat bread because he doesn't like the feel of other foods), he has trouble looking people in the eye, and blurts out things and doesn't understand social cues, he's got a genius level intellect but others may perceive him as not all there. Oscar starts to believe he's not a real boy because he is viewed as so different. This touched me deeply, that this boy would feel so isolated and feel so unworthy. This is real, how cruel people are to those who are different. It breaks my heart in fact to see him suffer this way. I think this aspect of the book resonated deeply with me. I also appreciated Oscar's developing friendship with Callie, an apprentice to a healer who has no magic. The world-building was less impactful. I felt like there was more to be discovered and understood. Although I appreciated how the story builds slowly and the reader's understanding expands with continued reading, too much was assumed in this book, and too little spelled out. The concept of how magic was so crucial to the small island that Oscar lives on, with the folktale of the wizards who became large trees so they could watch over the island, that was pretty cool. Although I feel it sort of becomes less clear and tangible as the story goes along. I would say the reveal towards the end was quite interesting, but to talk about that too much would be a spoiler. Moments of great prose, and a fabulous finish that touched everything together into a very topical allegory with themes about the greed of the wealthy, and the potential to lose humanity through the pursuit of perfection. With that acknowledged, I have a lot of misgivings about this book. These misgivings contain SPOILERS. It started off fine enough, with a simple setting of light fantasy with little emphasis on world-building. For the about the first 150 pages the book is completely about Oscar Moments of great prose, and a fabulous finish that touched everything together into a very topical allegory with themes about the greed of the wealthy, and the potential to lose humanity through the pursuit of perfection. With that acknowledged, I have a lot of misgivings about this book. These misgivings contain SPOILERS. It started off fine enough, with a simple setting of light fantasy with little emphasis on world-building. For the about the first 150 pages the book is completely about Oscar's unusual nature. He enjoys his quiet simple life, he even excels at it! But he is still made forcibly aware of how different he is. He can never understand what people want from him, he doesn't do well with facial expressions or social niceties. He wants to just be a good and loyal hand to Master Caleb and even to his master's apprentice Wolf to some extent too. The main problem with that is, even though Master Caleb and Wolf are presented for the first several chapters as comprimising the main character's world in many ways...they both die before they can get much exposition. Wolfe especially, along with another apprentice, die mysteriously and horribly towards the beginning of the novel and their deaths are never tied to anything in the rest of the book. The only thing accomplished by their deaths is to give Master Caleb one more thing to actively not care about. Callie's mistress as well, is a needless plot complication. She disappears almost immediately and only in the very last chapter is she wrapped up as an afterthought with Callie saying oh she's not coming back ever for really no reason. These masters and apprentices only seem to have existed in the first place to try and give some sort of haphazard reason as to why every single adult and child from one city and one village would suddenly and almost unquestioningly put their needs exclusively into the hands of two unaccredited poor children. There is literally ONE adult in both cities put together who cares at all, the Baker (He cares by giving Oscar some bread and then leaving town forever.) It still doesn't make any sense, like the specifics of the plot were deemed unimportant as long as all of the issues were squeezed in. Another troublesome point is that Oscar's origin is repeatedly questioned throughout the book, and it is never answered for either. For about the first half of the book, the narrative seems to be about him learning to understand and accept his origins and hopefully his differences too. There are even funny parts where Oscar is completely nonplussed as to what someone is talking about, but it is incredibly obvious to the reader. However, once Oscar and Callie go into the city together, a completely different plot is introduced about the ailing children. Oscar's singularity as a character is never brought back to center stage after that moment, which is too bad because I thought that a fantasy-themed book that was secretly about Asperger's would have been pretty cool! Unfortunately, I think the author got carried away with trying to force way too much into this little book for grade school kids: Asperger's, fantasy, elitism, magic, dictatorships, poverty, ignorance and so many other issues that I lost track because a a short book that is also trying to highlight its own prose should never try to be about that many things at once. I think this could have been three pretty good books, but for one is would need a lot of plot elements taken out, and a lot more explanations put in. One of the things I was most thankful for in the book was that Oscar's clearly Asperger's related traits were not explained away by magic gone wrong. I was HORRIFIED when this little boy had mistakenly come to the realization that the reason for all of his social awkwardness was that he was in fact NOT REALLY HUMAN. He gives up on trying to be better and gives up on learning to understand himself and others. He carries on in that mistaken self-identity for far too long for my liking, but thankfully it ended. I think the reason this book must be getting acclaim is because of all of the messages its trying to pump out. I'm not against books having messages,and I feel like Ms. Ursu's messages are very quality. I just feel that they were handled poorly here in terms of shoving them into a bag with this sweet little plot of a boy who loves cats and plants and never seems to understand people. Amendment: I happened upon another (4-star) review of this and got to thinking. It is true that this book is a bit of a challenge. I can almost see why some think it a 'drag.' But as that other reviewer implied, all readers need their own books. And that goes double for children. Reluctant readers shouldn't have to resort to Leveled Readers or Wimpy Kid, and advanced readers shouldn't have to resort to books that are too old for them. I'm torn. Do I read it again immediately, or wait a fe Amendment: I happened upon another (4-star) review of this and got to thinking. It is true that this book is a bit of a challenge. I can almost see why some think it a 'drag.' But as that other reviewer implied, all readers need their own books. And that goes double for children. Reluctant readers shouldn't have to resort to Leveled Readers or Wimpy Kid, and advanced readers shouldn't have to resort to books that are too old for them. I'm torn. Do I read it again immediately, or wait a few months? I need to do so at some point, because reading for the adventure & character dev. wasn't nearly enough. A lovely, lyrical tale, alternately heart-warming and heart-rending, this book tackles some deep and thorny issues (autism, abuse, overconsumption, hedonism and exploitation of the poor by the rich among them) without bogging down or losing the fantasy-mystery plot. There's some beautiful language here, yet the narrative voice is perfectly suited to the timid, awkward eleven-year-old boy MC. And I loved that all the characters were clearly described from the outset as having dark olive-toned ski A lovely, lyrical tale, alternately heart-warming and heart-rending, this book tackles some deep and thorny issues (autism, abuse, overconsumption, hedonism and exploitation of the poor by the rich among them) without bogging down or losing the fantasy-mystery plot. There's some beautiful language here, yet the narrative voice is perfectly suited to the timid, awkward eleven-year-old boy MC. And I loved that all the characters were clearly described from the outset as having dark olive-toned skin and dark hair, and the illustrations reinforce this -- so even though the story doesn't concern itself even slightly with issues of race, the reader can't default to the assumption that everyone is white. It's deftly handled and refreshing to see. My two-year-old is dealing with the concept of personhood. Lately she's taken to proclaiming proudly "I'm a person!" when she has successfully mastered something. By the same token, failure to accomplish even the most mundane task is met with a dejected, "I'm not a person". This notion of personhood and what it takes to either be a person or not a person reminded me a fair amount of Anne Ursu's latest middle grade novel The Real Boy. There aren't many children's books that dare to delve into the My two-year-old is dealing with the concept of personhood. Lately she's taken to proclaiming proudly "I'm a person!" when she has successfully mastered something. By the same token, failure to accomplish even the most mundane task is met with a dejected, "I'm not a person". This notion of personhood and what it takes to either be a person or not a person reminded me a fair amount of Anne Ursu's latest middle grade novel The Real Boy. There aren't many children's books that dare to delve into the notion of what it means to be a "real" person. Whole hosts of kids walk through their schools looking around, wondering why they aren't like the others. There's this feeling often that maybe they were made incorrectly, or that everyone else is having fun without them because they're privy to some hitherto unknown secret. Part of what I love about Anne Ursu's latest is that it taps directly into that fear, creating a character that must use his wits to defeat not only the foes that beset him physically, but the ones in his own head that make even casual interactions a difficulty. Oscar should be very grateful. It's not every orphan who gets selected to aid a magician as talented as Master Caleb. For years Oscar has ground herbs for Caleb, studiously avoiding the customers that come for his charms, as well as Caleb's nasty apprentice Wolf. Oscar is the kind of kid who'd rather pore over his master's old books rather than deal with the frightening conversations a day in his master's shop might entail. All that changes the day Wolf meets with an accident and Caleb starts leaving the shop more and more. A creature has been spotted causing awful havoc and the local magic workers should be the ones to take care of the problem. So why aren't they? When Oscar is saved from the role of customer service by an apprentice named Callie, the two strike up an unlikely friendship and seek to find not just the source of the disturbance but also the reason why some of the rich children in the nearby city have been struck by the strangest of diseases. Though Ms. Ursu has been around for years, only recently have her books been attracting serious critical buzz. I was particularly drawn to her novel retelling of Hans Christian Andersen's "The Snow Queen" last year in the form of the middle grade novel Breadcrumbs. So naturally, when I read the plot description and title of The Real Boy I assumed that the story would be some kind of retelling of the "Pinocchio" tale. As it turns out, there is the faintest whiff of Pinocchio circling this story, but it is by no means a strict model. As one of the librarians in my system put it, "I am scarred for life by Pinocchio (absolutely abhor any tale relating to inanimate objects longing to become real to the point where I find it creepy) but did not find this disturbing in the least." Truth be told it would have been easy enough for Ursu to crank up the creepy factor if she had wanted to. But rather than clutter the text up with unnecessary disgust, the story is instead clean, fast, exciting, and to the point. And for all that it is 352 pages or so, you couldn't cut it down. There have been a fair number of novels and books for children this year that have been accused of being written with adults rather than children in mind. I've fielded concerns about everything from Bob Graham's The Silver Button to Cynthia Rylant's God Got a Dog to Sharon Creech's The Boy on the Porch. Interestingly, folks have not lobbed the same criticisms at The Real Boy, for which I am grateful. Certainly it would be easy to see the title in that light. Much of the storyline hinges on the power of parental fear, the sometimes horrific lengths those same parents will go to to "protect" their young, and the people who prey on those fears. Parents, teachers, and librarians that read this book will immediately recognize the villainy at work here, but kids will perceive it on an entirely different level. While the adults gnash their teeth at the bad guy's actions, children will understand that the biggest villain in this book isn't a person, but Oscar's own perceptions of himself. To defeat the big bad, our hero has to delve deep down into his own self and past, make a couple incorrect assumptions, and come out stronger in the end. He is helped in no small part by Callie. I feel bad that when in trying to define a book I feel myself falling back on what it doesn't do rather than what it does do. Still, I think it worth noting that in the case of Callie she isn't some deux ex machina who solves all of Oscar's problems for him. She helps him, certainly. Even gets angry and impatient with him on occasion, but she's a real person with a personal journey of her own. She isn't just slapped into the narrative to give our hero a necessary foil. The same could be said of the baker, a fatherly figure who runs the risk of becoming that wise adult character that steps in when the child characters are flailing about. Ursu almost makes a pointed refusal to go to him for help, though. It's as if he's just there to show that not all adults in the world are completely off their rockers. Just most, it would seem. There's one more thing the book doesn't do that really won my admiration, but I think that by even mentioning it here I'm giving away an essential plot point. Consider this your official spoiler alert, then. If you have any desire to read this book on your own, please do yourself a favor and skip this paragraph. All gone? Good. Now a pet peeve of mine that I see from time to time and think an awfully bad idea is when a character appears to be on the autism spectrum of some sort, and then a magical reason for that outsider status comes up. One such fantasy I read long ago, the autistic child turned out to be a fairy changeling, which explained why she was unable to communicate with other people. While well intentioned, I think this kind of plot device misses the point. Now one could make the case for Oscar as someone who is on "the spectrum". However, the advantage of having such a character in a fantasy setting is that there's no real way to define his status. Then, late in the book, Oscar stumbles upon a discovery that gives him a definite impression that he is not a human like the people around him. Ursu's very definite choice to then rescind that possibility hammered home for me the essential theme of the book. There are no easy choices within these pages. Just very real souls trying their best to live the lives they want, free from impediments inside or outside their very own selves. I've heard a smattering of objections to the book at this point that are probably worth looking into. One librarian of my acquaintance expressed some concern about Ursu's world building. She said that for all that she plumbs the depths of character and narrative with an admirable and enviable skill, they never really felt that they could "see" the world that she had conjured. I suspect that some of this difficulty might have come from the fact that the librarian read an advanced reader's copy of the book without the benefit of the map of Aletheia in the front. But maybe their problem was bigger than simple geography. Insofar as Ms. Ursu does indulge in world building, it's a world within set, tight parameters. The country is an island with a protected glittering city on the one hand and a rough rural village on the other. Much like a stage play, Ursu's storyline is constricted within the rules she's set for herself. For readers who prefer the wide all-encompassing lands you'd see in a Tolkien or Rowling title, the limitations might feel restrictive. Now let us not, in the midst of all this talky talk, downplay the importance of illustrator Erin McGuire. McGuire and Ursu were actually paired together once before on the underappreciated Breadcrumbs. I had originally read the book in a form without the art, and it was pleasant in and of itself. McGuire's interstitial illustrations, however, really serve to heighten the reader's enjoyment. The pictures are actually relatively rare, their occasional appearances feeling like nothing so much as a delicious chocolate chip popping up in a sea of vanilla ice cream. You never know when you'll find one, but it's always sweet when you do. Breadcrumbs, for all that I personally loved it, was a difficult book for a lot of folks to swallow. In it, Ursu managed to synthesize the soul-crushing loneliness of Hans Christian Andersen's tales, and the results proved too dark for some readers. With The Real Boy the source material, if you can even call it that, is incidental. As with all good fantasies for kids there's also a fair amount of darkness here, but it's far less heavy and there's also an introspective undercurrent that by some miracle actually appears to be interesting to kids. Whodathunkit? Wholly unexpected with plot twists and turns you won't see coming, no matter how hard you squint, Ursu's is a book worth nabbing for your own sweet self. Grab that puppy up. A beautiful story about friendship and honor in the face of betrayal and danger, The Real Boy is one of the best MG novels I've read this year. Anne Ursu brilliantly weaves classic fantasy tropes into a fresh new story. A must-read. When an author takes common fantasy tropes and conventions, flips them on their heads, then tosses in fairy-tale twists creating a new race of beings, take notice. This is the best middle grade fantasy story I've read in 2014. The unpredictable plot, emotional arc of the protagonist, layered themes, gorgeous writing, and excellent pacing blurred my expectation of how a typical fantasy story plays out. Scattered throughout my writing notes are lines, "Oh, oh, oh! I did not see that coming!" or "g When an author takes common fantasy tropes and conventions, flips them on their heads, then tosses in fairy-tale twists creating a new race of beings, take notice. This is the best middle grade fantasy story I've read in 2014. The unpredictable plot, emotional arc of the protagonist, layered themes, gorgeous writing, and excellent pacing blurred my expectation of how a typical fantasy story plays out. Scattered throughout my writing notes are lines, "Oh, oh, oh! I did not see that coming!" or "great twist!" It is such a delight to be surprised and it happened so many times I couldn't put the book down. Don't pass on this novel that will be released September 24. Caleb, the greatest magician in the Barrow, owns a magic shop getting help from two assistants: Wolf, his apprentice with magic talents, and the nonmagical orphan Oscar, his hand. The Barrow is a forest of ancient wizard trees that feed the soil with magic surrounding the enchanted walled city of Asteri meant to protect citizens after a plague killed the townspeople hundreds of years ago. Oscar works in the cellar making magical potions with herbs, a task considered too menial for the magician's apprentice, Wolf, who bullies and mistreats Oscar. When the city children become ill while Caleb is away and a monster starts attacking people in the forest, Oscar tries to deal with it aided by his friend, Callie, another nonmagical person who works for a Healer. Already the trope of the hero with superior brains, muscle, or magical powers is missing and while Oscar grows into the role of saving the city, he's painfully shy and socially awkward, to the point that I wondered if he was autistic or abused. Callie, his newfound friend, helps him deal with people and helps him make friends. She is a kind, giving, no-nonsense girl who pesters Oscar even when he tries to sink back into his uncommunicable shell. The villain is not your fantasy-type Dark Lord. He's more misguided and I didn't even know he was the bad guy until quite a ways into the plot. He's eliminated quickly in the story compared to a typical fantasy before the story takes a fairy tale twist that made me think Oscar's social interaction problems might not be autism at all. Later, I wondered if the villain was "magic" in general and not a person. Nothing fits in a neat genre box in this tale. Oscar also reminds me more of a hero found in Grimm's fairy tales that run off into the enchanted forest as a way of dealing with issues. This blurring of fantasy and fairy tales makes the story unpredictable and quite fun to read. Not that this is surprising. Anne Ursu blended realistic fiction and fairy tales in her previous book, Breadcrumbs, that has a basketful of references to children's books and fairy tales. The Real Boy follows the same vein except the references are sprinkled throughout and names not given directly, meaning readers have to make connections on their own. I'm hesitant to discuss the fairy tale aspect because I don't want to give away the terrific plot twists, but I think it's safe to mention Wolf and Bonnie, who wears a red cloak to the likes of Little Red Riding Hood. What happens to them made me think of the woodcutter and they way it ties in with the wizard trees is funny if not gruesome. I don't know how many young readers will make the connection but one thing I like about Ursu's writing is that it appeals to adults and children. She's so steeped in folklore it oozes in her stories; I think she has fairy blood or is related to the Brothers Grimm or Hans Christian Andersen. The emotional arc of Oscar is well-written with him going from painfully inept while interacting with others to learning to say the right thing. We all go through this phase, but it is particularly difficult to learn as a youngster where peers are easily insulted and friends can shun for minor offenses. Callie is the type of friend we all hope for, one who helps Oscar, is slow to offense and when she is insulted is willing to forgive and move on. Oscar grows up each time he interacts with Callie slowly becoming more personable. I love how he learns to apologize to Callie and does it with a question mark. He's not sure what she wants at first and becomes more sure as the story progresses. Oscar also can't read peoples faces. "If only Oscar spoke face." Eye rolling completely baffles him and by the end of the story he's confidently rolling his eyes at Callie. Any reader will identify with Oscar's small steps outside his comfort zone. "The shelves were so very much taller than he could even dream of being, and Oscar firmly believed people shouldn't go any higher than they already were." When Callie admits her weakness the pair team up and build on each others strengths. Oscar does reach for those "shelves" eventually and I was rooting him each step of the way. Some adults command Oscar to look them in the eye and put him down for being odd. The words hurt Oscar. Other adults show that they care and are concerned about Oscar. I would have liked a bit more development on the greedy adult leaders in the Barrow who were selling magic for money to others in the continent. I had a few questions whether or not the same products that were being sold to the city people (the big expensive product - I don't want to give it away). I wasn't sure how or if the Healer fit in with Caleb. Also, Malcolm is kind to Oscar and represents actions of a nonmagical adult, but I wanted a bit more on his interest with Oscar to the point that he makes his generous offer. It shows that Oscar is desirable and wanted by an adult, but I wasn't sure what was motivating Malcolm. These questions are minor and I should really reread the story to catch more details and see if some of the questions are there only I missed them as I blazed through the story. That's my flaw - I am not detail-oriented. And I have too many books on my to read pile to go back and reread it. The writing is gorgeous and I kept writing down favorite lines to the point it looked like I was rewriting the story. I had to force myself to stop. "The wind pushed over the wizard trees, tearing the roots from the ground, leaving great mourning gashes in the soil. The roots gulped and gasped and grasped. The gashes in the ground grew under his feet; the wind battered his body." Or "Whenever Callie said something to a customer, he took the words and placed them on a map in his mind. On When a customer approaches he put a pin that read How may I assist you? No one else needed to do this. No one else needed lessons on how to be a person." The glass house and what happened to it is a nice symbol of this change in Oscar as he learns to understand humans. I remember trying to learn the same thing when I got a waitressing job as a 14-year-old. We all need these lessons but Oscar doesn't realize it. Multiple themes layer this story. I particularly liked the insatiable hunger of magic and people and how it parallels our own history regarding the destructive side of commercialism and the environmental crisis as a result of poor stewardship and greed. Oscar must take drastic measures to restore balance to the earth just like we have had to in the past, present, and future. In addition, the city people attempt to use magic creating a Utopia where there is no suffering. Oscar calls this "a beautiful lie" that is unobtainable. Oscar discovers that the underlying problem is fear in the townspeople. Once he realizes this, he discovers that he must face his internal fears as well; that just like the townspeople are stymied, so is he. When he gives Sophie his carved cat, it symbolizes his release of his own fears; his fears of meeting people, being unwanted, and making friends. The human condition is full of uncertainty and each person has to learn to live with that moving beyond the crippling effects of fear. Read it with my 11-year-old son, and we both loved it. Oscar was completely relatable to my son on the spectrum, as he could identify with Oscar's struggles to understand other people, to fit in to the world. And he particularly loved all references to The Most Spectacular Goat. We will definitely read more from this author. And even though fant While fantasy is not my preferred genre, I can't deny the flow, beauty, and simplicity of Anne Ursu's writing. The symbolism of Oscar's journey in discovering his own humanness was very real despite the fantastical setting. While Ursu herself has said that the main character of Oscar is not her son, it is clear Oscar's struggles are inspired by the fact that her own son is living with Asperger's, which is made further evident when you notice that the book is dedicated to him. And even though fantasy is not my preferred genre, I love that Ursu found a way to write a story about a boy with Asperger's and place him in a fantastical setting rather than a typical real-life one. This is not a straight-up "issue book", which is refreshing to see a boy with Asperger's portrayed as the hero of a fantasy world rather than just a boy in a realistic fiction novel who learns to live with his special need. Not that those stories aren't powerful in their own right, but seeing a special needs character move beyond a typical "issue book" is a giant step forward in children's literature. Oscar is the downtrodden assistant of the only magician left in the Barrow, the lower class but magical market town for the shining city of Asteri. He is abused by the apprentice, Wolf, until Wolf is brutally murdered in the forest. Caleb has magical business on the Continent, so leaves Oscar to run the shop, with few instructions. Since Oscar usually collects and processes the herbs used in the spells for sale, he doesn't do well dealing with customers. Luckily, the apprentice of the healer see Oscar is the downtrodden assistant of the only magician left in the Barrow, the lower class but magical market town for the shining city of Asteri. He is abused by the apprentice, Wolf, until Wolf is brutally murdered in the forest. Caleb has magical business on the Continent, so leaves Oscar to run the shop, with few instructions. Since Oscar usually collects and processes the herbs used in the spells for sale, he doesn't do well dealing with customers. Luckily, the apprentice of the healer sees his plight and helps him out. Callie teaches him how to interact with others and is a great comfort when things slowly go more and more awry. Callie is desperately trying to cure the sick children in Asteri, to no avail, but worse problems are arising. The shops in the Barrow are all attacked, and many are destroyed. The destruction spreads as far as the green house were Caleb grows herbs, and the forest as well. With the number of sick children growing, Callie and Oscar try to figure out what has gone wrong in the Barrow and to fix it before it is too late. While reading, "The Real Boy," there were times I was struck by a sentence & how perfect it was. Good authors do that. "Eventually, sleep reach its tentacles out and pulled him close." "It was like Callie covered her meaning in cushions and invited people to settle back into them." "There is a way the truth hits you, both hard & gentle at the same time. It punches you in the stomach as it puts its loving arm around your shoulder." I loved this story so much. It's not what I would typically While reading, "The Real Boy," there were times I was struck by a sentence & how perfect it was. Good authors do that. I loved this story so much. It's not what I would typically read, which made my fascination with it grow. I think partly because the writing was just SO good that it pulled me in. There are twists and turns and all the time you are completely captivated. The Real Boy by Anne Ursu – The Real Boy by Anne Ursu – Audiobook- Decided to enjoy a reread of this book, beautiful treasure, glad I entered Anne Ursu’s world again, pretty incredible. Note- normally I don’t post about advanced reader copies of books but I don’t want to overlook the opportunity to share about this brilliant book- date out: September 24th, 2013. Wow, I was quite surprised to find a connection between this fantastic new book and an audiobook I just completed. 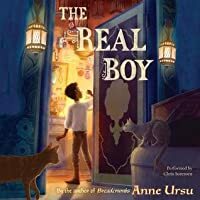 What a world Anne Ur The Real Boy by Anne Ursu – The Real Boy by Anne Ursu – Audiobook- Decided to enjoy a reread of this book, beautiful treasure, glad I entered Anne Ursu’s world again, pretty incredible. This is a strong middle grade fantasy with a well-developed world and a unique story. It's rich with ideas about social privilege and revisionist history, and I liked that the main character, Oscar, had some challenges relating to people. He has characteristics of someone on the Autism spectrum, but this being a fantasy, it's never put in those terms. (I personally related to him because whatever dramatic things happened in the story, he would really rather be in his quiet room hanging out with This is a strong middle grade fantasy with a well-developed world and a unique story. It's rich with ideas about social privilege and revisionist history, and I liked that the main character, Oscar, had some challenges relating to people. He has characteristics of someone on the Autism spectrum, but this being a fantasy, it's never put in those terms. (I personally related to him because whatever dramatic things happened in the story, he would really rather be in his quiet room hanging out with the cats. Me too, Oscar!) I have the feeling I'd get a lot more out of the story after reading it for a second time, which isn't something I typically say about this genre. এতদিনের জানা ইতিহাস মিথযা হয়ে গেল!! যাদু ছাড়া মানুষ এবং অনযরা টিকে থাকতে পারবে কি!! যাদু ফিরিয়ে আনার কোন উপায় কি আছে!! নাকি যাদু ছাড়াই টিকে থাকার চেষটা করবে ওরা!! এতদিনের জানা ইতিহাস মিথ্যা হয়ে গেল!! যাদু ছাড়া মানুষ এবং অন্যরা টিকে থাকতে পারবে কি!! নাকি যাদু ছাড়াই টিকে থাকার চেষ্টা করবে ওরা!! Although the writing was beautiful at times and the overall themes had great potential, the execution of this book was extremely disappointing and boring. I would never suggest this to a student because I doubt he would find any of it interesting enough to hold his attention. I love pretty books. And when I saw the cover for The Real Boy I knew I had to read this book. So I requested it via Edelweiss, and I was so happy to get accepted for. I have now read it, and I'm glad I did. It's an amazing middle grade book. The story is so good and I loved the main character, Oscar. He was adorable. I'm rating this book a four star. Because while it was totally amazing after about half the book, I did struggle a bit with it in the beginning. But still. It was awesome. And I enj I love pretty books. 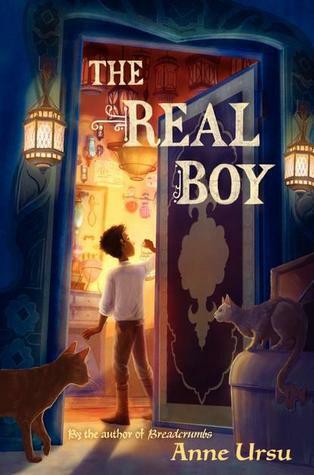 And when I saw the cover for The Real Boy I knew I had to read this book. So I requested it via Edelweiss, and I was so happy to get accepted for. I have now read it, and I'm glad I did. It's an amazing middle grade book. The story is so good and I loved the main character, Oscar. He was adorable. I'm rating this book a four star. Because while it was totally amazing after about half the book, I did struggle a bit with it in the beginning. But still. It was awesome. And I enjoyed it much more than the author's other book. Just thought this one was so good. It's full of magic and cuteness and also so heartbreaking. The Real Boy is told from the point of view of eleven year old Oscar. Whom I just adored. He's a bit different from other kids, though. And it broke my heart. Yet I loved him so much for it. Though I do wish I had gotten a better answer by the end of the book. Still. He's adorable. He's kind, well, the kindest he knows how to be. He says some stupid things, but he doesn't know any better. And yeah. He's just so cute. And he has these adorable kittens! Loved reading about all of them. Too many to name them all. Which I just loved. They were all different and all so lovely and cuddly and sweet. Sigh. Need to cuddle my cat :) Anyway. I loved Oscar. We meet a lot of characters in this book. Oscar is the hand of a magician. Meaning he lives in the basement of his shop, doing things for him. Mixing a lot of sort of potions. I felt sorry for Oscar a whole lot. But, he didn't have it too bad. Except for Wolf, who also lived there. He was awful. Shudders. But I sort of liked Caleb, the magician. For the most part. He was a bit weird. And he could have taken better care of Oscar. Sniffs. But still. I did enjoyed reading about Oscar's life and the people in it. So much. We also meet this girl, Callie. And oh, I loved her. She's kind and brave and all kinds of amazing. She's a great friend. And a good healer and person. I enjoyed reading about her a lot. We also see some other people, some who were pretty amazing. And others not so amazing. But I did enjoy reading about all of them. Anyway. There is a story in this book. But I won't spoil it. Just know that it is amazing and sort of fun but also a bit scary. And so heartbreaking. Lots of sad, heartbreaking stuff. I loved every moment. Someone told me they thought this was a pinocchio book by looking at the cover and title. I didn't get it at first. They I read the book. And it makes so much sense, in a creepy way. Nothing like pinocchio, but sort of the same. I loved it. I don't really want to say anything else about this book. The plot is amazing. The characters perfect. It is a great middle grade book. One that I feel that everyone should read when it comes out in September. So yeah. Go buy it! Then read it and cry a bit like I did. Sobs. <3 Love. Oscar is a wonderful protagonist, endearing and lovable. He made the mother in me Originally posted here at Random Musings of a Bibliophile. Oscar is a wonderful protagonist, endearing and lovable. He made the mother in me want to give him a home. (But not hugs and kisses because he wouldn't like that.) Something is different about Oscar, something is not all normal, something's a little off. I don't want to say too much more about that so as not to give spoilers, but I loved what Ursu did with his character. Nicely subversive that is. Callie, who befriends Oscar, is just as enjoyable a character. They make a great team in everything they have to do together. I realize I'm being incredibly vague. Probably frustratingly so. I will continue to be about the plot as well. It is filled with action, and there is a huge mystery to solve. It is like a roller coaster ride in the dark that switches tracks and drops you down and backwards a few times. I went into it not having a clue what path the track was taking and it was fun that way. Not going to ruin anyone else's experience. Rest assured that Ursu has a firm grip on all the elements of her story and she wields her words perfectly. So my point? The book is amazing. Read it. Book talk it. Kids will love it. Oscar, the title character, is a hand, a step below an apprentice, to the most powerful magician in this fantasy setting. It is Oscar’s job to collect and combine the herbs that his Master and apprentice sell. He is told he is worthless, doesn’t know anything by many characters and he's come to internalize it. It is Oscar’s hero’s journey, and ours, to discover just how much he knows and is capable of. What’s fascinating and very well done about this novel to me is that Oscar is clearly on the a Oscar, the title character, is a hand, a step below an apprentice, to the most powerful magician in this fantasy setting. It is Oscar’s job to collect and combine the herbs that his Master and apprentice sell. He is told he is worthless, doesn’t know anything by many characters and he's come to internalize it. It is Oscar’s hero’s journey, and ours, to discover just how much he knows and is capable of. What’s fascinating and very well done about this novel to me is that Oscar is clearly on the autism spectrum, though that word is never used to describe him, since it was first used in 1942. Instead, his behaviors are described: he has difficulty looking people in the eye, he doesn’t understand facial expressions, he is able to concentrate and remember which plants do which things, but doesn’t know how to speak to his neighbors, he reads very well, but writing is difficult for him and many more. This is up there with The Speed of Dark, Mockingbird and a few others as exemplary novels describing an autistic person's thought processes. To this reader, mom and special education teacher, anyway. I think I have a weakness for stories about magician's apprentices. Not that Oscar is a real apprentice. He works in the basement of a magic shop, chopping and storing herbs, and other menial work. He knows herbs and cats, but not people. Then Oscar is thrust into the task of running the shop by himself, interacting with patrons and offering the right bit of magic to solve their problems. It's not his strong suit. Luckily, a fellow apprentice, Callie, agrees to help him understand people and run I think I have a weakness for stories about magician's apprentices. Not that Oscar is a real apprentice. He works in the basement of a magic shop, chopping and storing herbs, and other menial work. He knows herbs and cats, but not people. Then Oscar is thrust into the task of running the shop by himself, interacting with patrons and offering the right bit of magic to solve their problems. It's not his strong suit. Luckily, a fellow apprentice, Callie, agrees to help him understand people and run the store. Although it is not said in the text, since THE REAL BOY is set in a fantasy land, Oscar is somewhere on the autism spectrum. I thought this was well done, but I'm not sure whether it would work as well with the intended audience. I do enjoy the fable-like style of THE REAL BOY. Oscar and Callie live on the only island in the world with magic, but they soon discover that there are consequences of magic. They also learn that things aren't always what they appear to be, nor are people. On the other hand, I had issues with how the plot plays out. It doesn't make much sense when you think about it, even if it makes sense with the themes of THE REAL BOY. The pictures by Erin McGuire are terrific. They leave the characters' ethnicities ambiguous, so that kids can see themselves reflected in the pictures. They also match the descriptions in the text well. Filled with magic, the book described a boy who was believed to be different. Magic was the only thing he knew and brought him comfort along with his cats. Oscar was a boy who tried to understand the expressions and emotions people made. And although magic was the cities friend, it was quite dangerous. In the book you will find the cons and pros about magic, about the uses of it. People may use it for their small needs, they may even use it for bigger ones. Some so dangerous the magic itself cou Filled with magic, the book described a boy who was believed to be different. Magic was the only thing he knew and brought him comfort along with his cats. Oscar was a boy who tried to understand the expressions and emotions people made. And although magic was the cities friend, it was quite dangerous. In the book you will find the cons and pros about magic, about the uses of it. People may use it for their small needs, they may even use it for bigger ones. Some so dangerous the magic itself could be in danger. Perhaps magic shouldn't have existed in the first place. HAS SOME SPOLIERS!! AWESOME BOOK.LIKE HOW EVERYTHING IS IMPOSSIDE IN IT AND LOVE THE FANTESY.LIKE HOW OSCAR SAVES THE DAY BY DEFEATING THE MONSTER THAT WAS DESTORYING ALL OF ALETHRIEA'S MAGIC.CRAZY THAT THE CITYS' PEOPLE'S CHILDERN ARE GETTING SICK.AND THEY ARE NOT SOPOSE TOO.WHAT WILL OSCAR DO,AND HOW.I RECOMMED THIS BOOK TO PEOPLE WHO LIKE FANTESY. I had heard of this book because of its favorable portrayal of an autistic lead character, and in that the book truly does shine. The Real Boy follows a maligned orphan (that great fantasy tradition) working as a hand, a sort of apprentice's apprentice. Oscar has a fantastic memory of herbs, their uses, and the functions of the garden, and rarely interacts with people. He can't meet their eyes or read their mannerisms; his herbs and companion cats--and the rare smuggled book--are his joys in lif I had heard of this book because of its favorable portrayal of an autistic lead character, and in that the book truly does shine. The Real Boy follows a maligned orphan (that great fantasy tradition) working as a hand, a sort of apprentice's apprentice. Oscar has a fantastic memory of herbs, their uses, and the functions of the garden, and rarely interacts with people. He can't meet their eyes or read their mannerisms; his herbs and companion cats--and the rare smuggled book--are his joys in life. But when the master is away and his abusive apprentice is killed, Oscar is forced to run the magic shop, even as the rest of the town begins to fall apart amid mysterious attacks and illnesses. Oscar is an utterly relatable character. As the mom of an autistic son, and someone who has endured intense bullying, I found his plight hard to read at the start. I was relieved as Oscar formed a friendship with Callie, a healer's apprentice, and began to learn social skills to cope with public interactions. Note that the book does deal with some dark issues like death and abuse; it's not a pure-fluff escapist kind of read, but one with genuine depth along with some whimsy. "My boy, you cannot look to magic to solve all your problems. Magic is big and beautiful and terrible. The wizards understood, but no one else understands anymore. People treat it like some cheap little thing, a commodity that serves at their pleasure. Magic serves no one's pleasure but its own." This book was definitely something special. I picked it up because I read Anne Ursu's Breadcrumbs in February and absolutely loved it, so I knew I had to read more of her writing. And I'm so glad I did "My boy, you cannot look to magic to solve all your problems. Magic is big and beautiful and terrible. The wizards understood, but no one else understands anymore. People treat it like some cheap little thing, a commodity that serves at their pleasure. Magic serves no one's pleasure but its own." This book was definitely something special. I picked it up because I read Anne Ursu's Breadcrumbs in February and absolutely loved it, so I knew I had to read more of her writing. And I'm so glad I did. We follow Oscar, a magician's hand who doesn't quite fit in, and Callie, the first person he can really call a friend. Magic isn't working, monsters are appearing, and City children are sick. And wow good grief I love Oscar so much. I'm just so proud of my son he makes me happy. I love Callie too but Oscar. I still think I enjoyed Breadcrumbs more. I do enjoy Anne Ursu's writing style but it seemed a bit... much... in this book? Idk there were some points that seemed hard to follow because of the flowery writing. But the plot was so gripping and interesting and like I said, the characters are great. So I did really love it, but I don't know that it's a favorite. Yeah. "There is danger in small enchantments, my boy. Small enchantments make us dream of big ones." This was the most wonderful and (un)expected retelling of Pinocchio I've read. Oscar has trouble acting the way that others do--he doesn't understand small talk, doesn't know how to infer from people's indirect questions. But as his master is called away, he's left to run the magic shop, something hugely outside of his comfort zone. This retelling offers discussions surrounding on just what "real" is, the importance of the environment, and when it's best to let non-understanding to remain not This was the most wonderful and (un)expected retelling of Pinocchio I've read. Oscar has trouble acting the way that others do--he doesn't understand small talk, doesn't know how to infer from people's indirect questions. But as his master is called away, he's left to run the magic shop, something hugely outside of his comfort zone. This retelling offers discussions surrounding on just what "real" is, the importance of the environment, and when it's best to let non-understanding to remain not understood. This tale is just so incredible in deconstructing what we think we know, cultural knowledge, and our understanding of humans. Not only that, but it offers a fantastical setting for an autistic main character--I've personally never seen fantasy with dis/abled main characters, so this was something just wonderful to see! The Real Boy had me shocked, confused, eager to read more. I had to step away from it, I had to come right back. It left me reeling with so many emotions. Overall, it was a great book, and a good one, too. It's so worth the read. You will not be disappointed. I regret not writing my review for this book right after I read it when this was fresh on my mind. Here's what I remember... it's kinda creepy similar to The Night Gardner by Jonathan Auxier (which is also quite good) More importantly though, its touching. I thought it might be a Pinocchio retelling, and the furthest i'd go would be to say it was inspired by that story. The main character is an orphan boy who feels different than everyone else. Mostly because he doesn't feel as many things as the I regret not writing my review for this book right after I read it when this was fresh on my mind. Here's what I remember... it's kinda creepy similar to The Night Gardner by Jonathan Auxier (which is also quite good) More importantly though, its touching. I thought it might be a Pinocchio retelling, and the furthest i'd go would be to say it was inspired by that story. The main character is an orphan boy who feels different than everyone else. Mostly because he doesn't feel as many things as they do, and he doesn't understand so to read their feelings either. A unique friendship develops between Oscar and a girl from the village who helps him with his people reading problems. My 11-year-old thought I should read this, so I did. Anne Ursu is the author of several fantasies for young readers, including THE REAL BOY, which was longlisted for the National Book Award, and BREADCRUMBS, which was named as one of the best books of the year by Publishers Weekly, Amazon, and School Library Journal. She is also the recipient of a McKnight Fellowship. She teaches at the Hamline University's Masters of Fine Arts in Writing for Childr Anne Ursu is the author of several fantasies for young readers, including THE REAL BOY, which was longlisted for the National Book Award, and BREADCRUMBS, which was named as one of the best books of the year by Publishers Weekly, Amazon, and School Library Journal. She is also the recipient of a McKnight Fellowship. She teaches at the Hamline University's Masters of Fine Arts in Writing for Children and Young Adults, and lives in Minneapolis. Her next book, THE LOST GIRL, will be out in February 2018.